Kenneth M. Clark, his sale; Christie's, London, 22 February 1918, lot 131 (260 gns to Tooth). Art Journal, 1881, p. 216. London, Royal Academy, 1881, no. 419. No. 419. 'Hope Deferred,' BRITON RIVIERE, R.A. Elect. 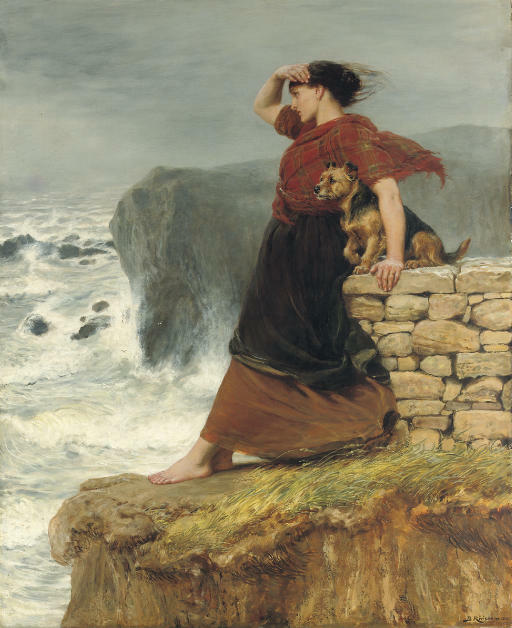 On the edge of a high cliff against which the waves are dashing stands a girl shading her eyes with her hands, and gazing with an eager look over the raging waste of waters. By her side sits a little rough-haired terrier, whose face shows how thoroughly it sympathises with the anxiety of his mistress. Riviere excelled at canine pathos. In one of his best known works, Sympathy of 1877 (Royal Holloway College), a terrier comforts an unhappy child. His predecessor, Landseer, had shown how dogs might be deployed in The Old Shepherd's Chief Mourner of 1837 (Sheepshanks Collection, Victoria & Albert Museum), while Riviere was to employ the device again in Requiescat of 1889, (The Forbes Collection, Christie's, London, 19 February 2003, lot 39) where a bloodhound stands guard at the catafalque of a recumbent knight. The present picture was executed at the height of Riviere's career, when he sent four pictures to the Academy in the year he was elected R.A. The composition is dramatic and uncomplicated, and would have stood out amongst its peers on the walls of Burlington House.